Splatterhouse has a plot straight out of a cheesy 80’s horror flick. Rick and Jennifer visit a haunted mansion and are attacked by monsters. Rick is killed, but is brought back to life by a mask that gives him super-human powers which he uses to fight through the mansion to rescue his girlfriend, who has been kidnapped by the mansion’s denizens. Splatterhouse’s game play is exceedingly simple – attack everything that moves while avoiding being hit by anything or anyone. Unlike other beat ’em ups like River City Ransom and Streets of Rage there is no 3-dimensionality to the game, so you can only move left and right on the screen. Rick is a big lumbering guy who doesn’t have any finesse moves to get you out of danger, so you have to rely on your fists. Early in the game, your only weapon is a 2×4 that you swing like a baseball bat, sending your enemies splattering across the back wall. 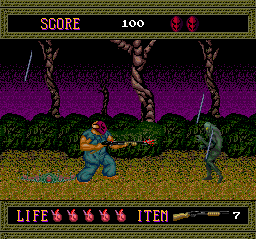 Splatterhouse starts off slow, but by the third stage you’re wielding a shotgun and fighting a boss who has chainsaws for hands. Later in the game you walk through a hallway of mirrors where you fight reflections of yourself. By the last stages of the game, Splatterhouse takes on a more surreal tone as it seems to take place not in the mansion but in hell itself. Although the game play is pretty repetitive, the introduction of new weapons along with an incredible variety of enemies and environments keeps the game feeling fresh level after level. While the difficulty definitely ramps up as the game progresses, it’s worth the challenge just to see the final boss battle, which is nothing short of gross. Splatterhouse’s detailed visuals and creepy horror movie-inspired music really tie the atmosphere together. Your life meter is made up of little human hearts! The game is a truly original title that has never really been recreated outside of its sequels on the Genesis. Buy Splatterhouse on GameGavel or Amazon. Tagged Beat 'em Up, Horror, HuCard, Namco, PC Engine, Review, Splatterhouse, turbografx, turbografx-16. Bookmark the permalink.